#Office365Challenge – Did you know that Excel can read cells to you so you can proofread it? Well, neither did I. Picked this cool tip up today from a friend Corrie, thanks cupcake!! Many a times I find myself having to check data that I’ve read into Excel from another Excel document or even a printed document. This is SO much easier if you can follow on the source document while listening to the cells being read out to you. Here I’ve changed the selection to “Commands not in Ribbon”, because yes, not all the commands are showing on your Ribbon in Excel. I’ve created a new custom group under my Review Tab called More. I then select “Speak Cells” and add it to this newly created group. (Refer to above post for more detail on how to do this). 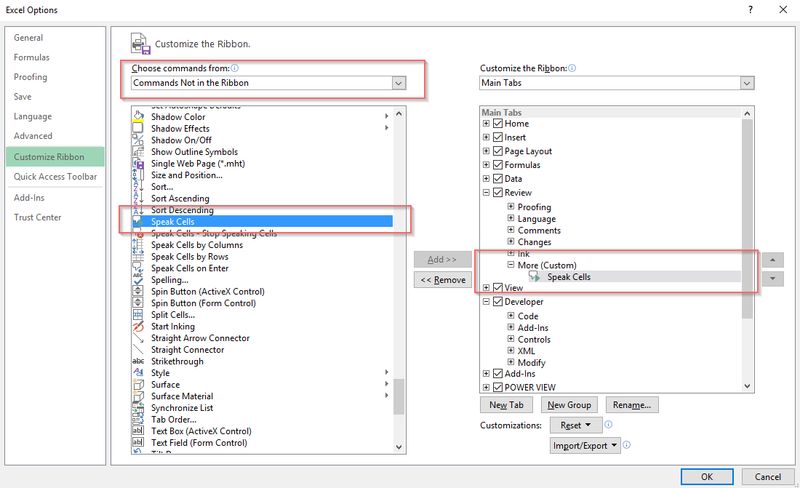 Now back in Excel, you’ll be able to select cells, click on the “Speak Cells” command, and it will be read out to you, while you’re checking it on the other document to make sure your input was correct. You are so welcome Lynne!